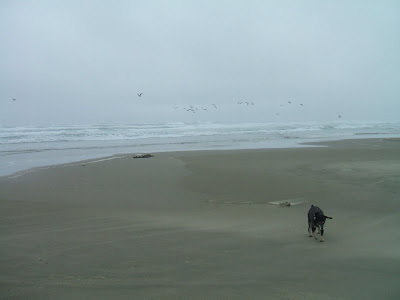 The Oregon coast is beautiful any time of year, although cloudy skies and rain are always a possibility. I (Mo) usually try to spend a few days there in the fall. 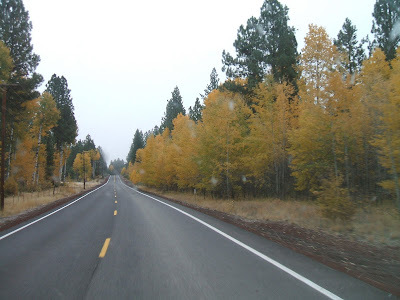 On Tuesday, October 20, I left (with Abby as my copilot and companion) at 8 am, traveling via Westside Road on the western edge of Recreation Creek and the Upper Klamath Lake National Wildlife Refuge. There was fog all the way from home, along Highway 97 through Chiloquin and Chemult to Highway 58, and over the Cascades. I took a few photos through the windshield of the fog and brilliant colors of turning leaves. The entire trip only took 5 pleasant hours of driving. 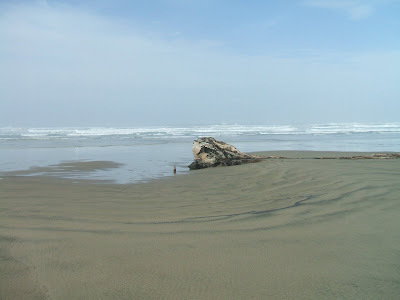 At Eugene, I traveled west along Highway 136 to Florence, and then north to Beachside State Park just a bit south of Waldport. When I arrived in the afternoon, temperatures were in the 60’s. In order to camp for 3 consecutive nights, I had to take one of the only five unreserved campsites available. 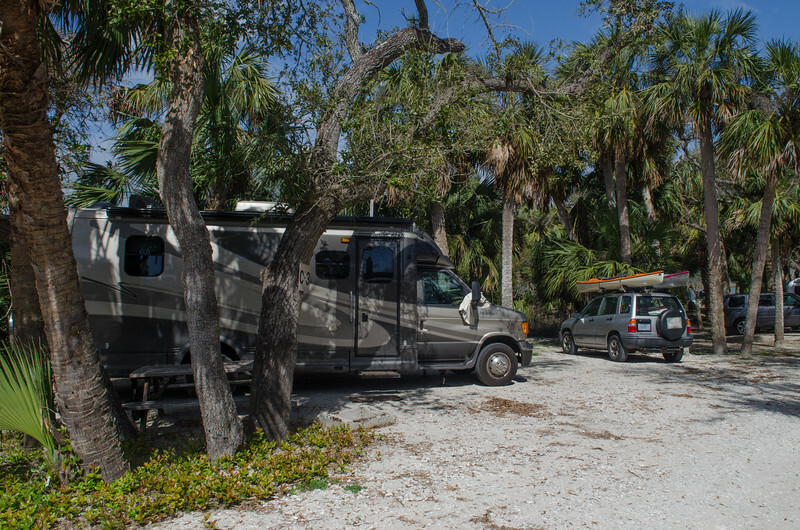 The campground has a total of 33 electrical sites with no sewer or dump. Ten of those sites are right on the beach, but they were filled. I settled in to a site three rows back, but can still hear the ocean and a walk to the beach is “nothing”. I stayed at the beach until Friday morning. I enjoyed sleeping in until 8am on Wednesday, good for both me and for Abby. My days were spent walking the beach, first toward the north on Wednesday, and then south on Thursday. The beach is long, open, and the sand is packed hard for great walking. There are no shells or rocks, but the waves and birds provide plenty of entertainment. Wednesday was windy and while cloudy in the morning, ended in the warm 60’s by afternoon. I walked, read, and relaxed. Without the “toad” on this trip, my entertainment was all on foot. We walked the campground in the evening where Abby found a tennis ball. She loves to play fetch and often will find a stray ball on our walks. I enjoyed my evening with a hamburger cooked over the outside wood fire and shared a little with Abby. along the way. 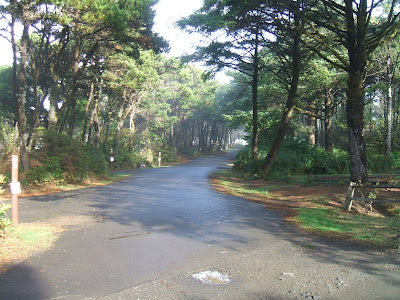 The campground is high on a bluff along the beach, although you could still hear the ocean and there was easy access to the beach. The cost was listed at $28 per night with electricity, but it would only be $14 with the senior pass. I made a tasty skillet breakfast of eggs, potatoes, and sausage upon my return, and then spent some time reading most of my current book. I walked around the campground again in the evening and noticed that many campers had left that day. By Friday the rain arrived after wonderful weather all week. Got up at 7:30 am and left the park around 11 am. Traveled Highway 101 south to Reedsport, then Highway 38 to Highway 138 and ended up in Sutherland. Passing the elk reserve along 138, I noticed a great many elk in residence. The last time I drove this route there weren’t any elk visible. It rained throughout the entire route until I reached Sutherland. The Seven Feathers Casino is at Sutherland, and I arrived around 2, stopped in for a bit of time, and paid my dues. Traveling south on I-5 to Medford and then over to HWY 140 home, I stopped in at Costco in Medford for inexpensive gasoline before driving over the mountain. I arrived home around 6 pm, with plans to drive to Klamath the next day to take advantage of the available dump station at Moore Park. I always enjoy the last October MoHo trip before the snow forces me to put her to bed for the winter. Sometimes late fall rains are part of that trip, however this time the weather was perfect and I was grateful for such a wonderful, relaxing trip. em to travel on one way or another. But the Comfort Suites in Visalia is pretty nice and I am catching up on our trip journal and reviewing photos. Don't bring a car, use the public transportation that is excellent and workable. Understand that even if you think you have time to do several things in a day, the scheduling may limit your options. Pick one important thing for each day and work around that. Wear really comfortable shoes and plan to walk a lot. If you want to see the White House, make your reservations with your congressman 6 months in advance. If you want to see congress in session, do the same. Lots of stuff is free and some isn't, but you won't have time to see everything, so do the free stuff. Go in October when it is cool and uncrowded, rather than spring when the cherry blossoms are blooming and everyone else is there too, or summer when it is killer humid and hot. The Smithsonian could take every single minute of time you have available, and it requires time to absorb all there is. Burnout can be an issue with "one more amazing museum" waiting. Take the time to tour the Capitol. The Washington Monument takes planning. The tickets are handed out early in the day and go fast. You will have to come back and actually go up the obelisk whenever there is available space. Get in line early because you will enter the elevator 8 at a time, no matter what time your ticket says. Alexandria is worth the extra time to really enjoy. Arlington Cemetery will require a commitment to walking hilly terrain to reach the lovliest and highest hills, including the Tomb of the Unknown Soldier. On Friday we had originally planned to take the Spirit river boat on the Potomac River to Mt. Vernon. It seemed that a one-way trip on the boat using the Metro and public bus for our return trip was a good idea. The ticket takers at the Spirit phone sales could not quite comprehend why anyone would want to do it this way, and had a very hard time figuring out the cost. At $84, it was only four dollars less than the round trip, so we thought better of that plan. It was a lot of money for just a short river trip. We also would have needed to board the bus at 5:40 am, take the Metro to unknown zones of the city in the dark, and try to get on the boat by 8am. After five days of museums, we looked at each other and said, "All this for one more wonderful museum?" Maybe not. Instead, we took a slow relaxed morning and planned to catch the Metro at 9 am. For the first time since we have been here, our trusty shuttle let us down. There were too many people for the van, and the driver had to return for us half an hour later. A couple of other minor things went wrong that morning as well, so the tone for the day was set at a fairly low point. Thinking maybe it was time to go up in the Washington Monument, we emerged again at the Smithsonian stop. It was only around 10 am by then, but all but a few of the tickets had been distributed. We stood in line to get our tickets with a tour time of 1:30 pm. We hemmed and hawed a bit because we really wanted to somehow get on the river. An afternoon boat ride would have been nice, but the tour was right in the middle of the time of day when we would have to manage transportation; either to a dock in Alexandria or in Georgetown. No matter how we tried, we couldn't figure out how to do all the things we wanted to do, especially if we had to be back at the monument at 1pm. Our solution was to walk north of the White House to check out the actual front of the building. For some reason there was a plethora of big pumper trucks and hoses blocking the view, so we weren't able to get close to the fence. It was a bit disappointing. "Let's keep walking and find the Mayflower Hotel", I said. Mo responded, "I am not that much into walking a lot today. Are you sure we are going the right way?" We were and eventually found the hotel quite impressive in both architecture and history. Many photos of presidents are hanging in fancy rooms with plaques describing the events. We boarded the metro at a nearby stop and emerged again at the Smithsonian exit in time for our afternoon tour of the Washington Monument. It was sunny and very warm with a stiff breeze that kept the temperatures tolerable. We have had perfect weather and clear skies the entire visit, so the bit of smog visible on the horizon was surprising. Even though our tour was scheduled for 1:30 pm, the line had already formed all around the platform. It was a good thing we got there early, because many people are scheduled for the same time, and entry to the monument is allowed only in groups of eight. Security is very tight for the monument and we all just waited patiently for our turn. Once inside, however, it was worth all the hassle. The monument elevator rises to the top in just 70 seconds. The elevator operators are knowledgeable tour guides offering enlightening explanations of how the monument was built and some of its history. The views from the top are worth the wait. Looking at the monument from below, tiny little rectangular peepholes are barely visible at the top. Those are the windows that all the tourists crowd around to see the views. I finally got a full and complete view of the city in all directions. Later in the afternoon ,we took the Metro to the southern part of town toward Maryland, hoping to find our way to the Water Street docks and the river. Suddenly we were in a completely different Washington. Switching from the Orange Line to the Red Line placed us in a world of lots of working people in a hurry to get home. Fewer suits and more jeans and dresses, and we were suddenly the minority in the crowd. It was a very dramatic shift. At the exit there was a lot of construction and few signs, so we followed what seemed to be the right direction and found the riverfront. There were a couple of large river cruise boats, but we couldn’t find any kind of water taxi or short afternoon river ride. Instead, we settled for a beer with chips and salsa at a fun little open air bar. Our waiter filled us in on some local history, saying that this part of DC is still trying to catch up to the development in other parts of the city, and is doing much better than before. He also told us about the cross town Circulator Bus, leaving every 10 minutes from right across the street. Just a buck (fifty cents for seniors) to go north and south, and another buck to transfer to the east-west Circulator. We sat down to enjoy the ride and got a real taste of city girl stuff when a young woman sat down across from us. She was dressed like a business person, talking on her cell phone using ear buds, and facing us directly. Looking me right in the eye, she was talking fast and furious, and I thought I had better answer her, since she seemed to be talking to me. I couldn’t understand a word she was saying with her strong ‘hood’ accent. It was really awkward and funny. She finally asked where we were from and when we said “Oregon”, she burst into derisive laughter, and told her phone friend, “Oh (some derogatory word) it’s Laverne and Shirley”. She obviously thought we were about as hick as they come. What she probably didn’t know is that our opinion of her wasn’t much better! It made for a very strange experience on that bus! We finally made it back to the Metro stop, and then home after a day that turned out well. The weather continued to be perfect on Thursday. We thought it would be fun to take the trains to a destination outside downtown DC. I had heard that Alexandria was another old town in the style of Georgetown, so that's where we headed. Alexandria was actually much more fun than Georgetown. The city was the third in the country to be listed on the national Register of Historic Places. It is a delightful walk back into the history of our country and its beginnings. In addition to being the city of George Washington near his Mt Vernon home, it was also the home of Robert E. Lee, and was a Union stronghold at the onset of the Civil War. It is truly charming, with homes and buildings from the 18th and 19th century, cobblestone streets, and great shopping and restaurants. The King Street Trolley is free, traveling from the Metro station stop to the waterfront along the Potomac. We arrived in town and looked for the visitor center. A very nice volunteer told us what not to miss and we decided to follow the self guided walking tour through town. There we saw many highlights, including the restored Torpedo Factory now filled with art studios and working artists. The architecture is amazing, and I took way too many pictures of houses, buildings and street views. I just can't resist. We took the tour of Gadsby's Tavern, where George Washington often ate in town when he was visiting from Mt. Vernon. Later, we walked past his townhouse just up the street from the tavern. Christ Church was especially lovely, where I sat in GW's pew, near a little plaque with Eleanor Roosevelt's name marking her position when she visited that church. Almost every president has worshipped here at one time or another. Meandering back through town, we found a delightful little French restaurant/cafeteria and had lunch outside watching people passing. It was great. Back up to the Metro station, the looming George Washington Masonic Memorial called us to travel farther up King Street. We climbed the steps of the imposing building, but it closed at 4 pm, so we didn't get to the 9th floor view. Just climbing the steps allowed an impressive picture of Alexandria with Washington DC and the Potomac in the distance. This was my favorite place for just spending time and exploring. It is much like Charleston, South Carolina in style and history. Traveling back to Falls Church on the Metro was simple and uneventful as usual. We are getting to be old pros at this subway thing. One of the reasons we decided to visit DC was a chance to visit the soils exhibit at the Smithsonian. We waited for the day with predicted rain thinking it would be a good time to be inside a museum. The rain never arrived and instead we were treated to another gorgeous blue sky and high winds. The shuttle provided by the Comfort Inn in Falls Church has been a great service. One more time we enjoyed our free breakfast, boarded the shuttle for the Metro, and discovered that just a bit beyond our usual stop at Metro Center was another stop called Smithsonian. Hmmm. After 20 minutes of fast, sometimes swaying train travel, we emerged from the darkness right on Capitol Mall in front of the museums. Nice. Mo has been to Auschwitz and this morning she suggested that we see the Holocaust Museum. "It might be difficult, but I would like to see it. I think it's important". I thought it might be like some of those difficult movies; sometimes we are better people for watching them. So we walked around the corner and down 15th street. Even though it was only 10am, the line had already formed for entry. Mo had said she wanted to compare the difference between the way the museum presented the Holocaust and how it was in Auschwitz. In my opinion, the best part of the museum was the depiction of the complexity of what led up to the Holocaust. The timeline showed how the German people were so ripe for change and full of fear that they bought into the Nazi propaganda. Walking through this display of human depravity was sobering. I have seen photos of the atrocities in the past. As a young person I read Exodus, and The Source, and always wanted to learn more, wanted to somehow understand. However, the image that struck me most deeply on this morning was an enlarged black and white photo of ordinary people in Germany. A lovely young blond girl was caught up in the excitement, her face lit up, enthralled, her arm raised in the Nazi salute. She was so young and looked so fresh and honest. I still don't understand. We left the museum sobered, wondering how anyone could say it didn't happen. The photos of the US servicemen, when they found the camps, was also sobering. The history of what happened and how so many people didn't believe it was happening was new to me. The magnitude of the Holocaust, the Pogroms, the hatred toward the Jews, made me angry to think of how this word "Nazi" is thrown around today in the political arena. Angry! It wasn't easy, but it is important to see it. It was important to go there. Mo said Auschwitz was different, with less history portrayed, but being at the actual site had a different impact. After that visit, we were quite ready for some time at the Smithsonian. We were ready for something light and airy and positive. Thinking a trip up the 70 second elevator for a view of the city from the Washington Monument would be nice, we headed back west. The winds, however, were gusting to 50 miles per hour and when we arrived the monument was closed for the day. After that momentary disappointment, we continued to the Museum of Natural History and the soils exhibit. It was a 'pleasant' exhibit with a focus on many aspects of soil in our society. There was a bit of science, but as a working soil scientist, it was less than I would have liked. It was soils 101 for the layman, a good thing I suppose, but in other parts of the museum, science isn't dummied down for people. The soil monoliths from all the states showed just how variable soils can be. I loved seeing them, but there was very little information about soil science as a science. After a short visit we wandered off into the halls to discover the rest of the museum. It was magnificent, overwhelming, and educational; full of surprises and knowledge. I could have stayed in the earth science hall much longer than we did. Complex exhibits on plate tectonics, meteorites, earthquakes, volcanoes, rock building and so much more, enthralled me. We saw the Hope diamond, not such a big deal after all the other exhibits. After a few hours, both of us felt completely overloaded with information. The ocean exhibit itself is enough to keep you occupied for hours. When we finally started to leave, we realized that we hadn't entered the mammals section. We detoured through rooms filled with more than 200 animals from all the continents. The display was in the typical style of a natural history museum with habitats and sound effects. We saw some animals neither of us had ever heard of. We could have stayed longer, but our brains were too full, and it was hard to absorb all we were seeing and learning. I hadn't expected that. Overload! I had heard it was true. I knew that it was easy to spend a week just at the museums on Capital Mall. I now see that a full week isn't enough to rest the brain in between subjects! It was getting late in the day, so after visiting the Natural History Museum, we had to choose one other that we wanted to see. We decided on the nearby Museum of American History. It was much simpler, but still interesting. Especially delightful was the display of the First Ladies inaugeral gowns, and the history of their political styles and focus. A surprise was the number of First Ladies who were sisters, nieces, or daughters of unmarried presidents. Very nearly brain dead after only one day, we made our way back to our Smithsonian stop on the Metro and went home to Falls Church. We ended our evening with a fabulous dinner at the Dogfish Head Brewery. Perfect day! We made arrangements to meet the shuttle at 9am for an arrival in town around 10am when things start opening. Breakfast at the hotel has been adequatewith a hard boiled egg and bagel for Mo and oatmeal and yogurt for me. The coffee is weak but I have found the Starbucks instant and love having it in my purse to beef up "dishwater" when it is needed. The price is right! We have a free breakfast every morning. The weather has been perfect every single day with moderate temperatures and no rain. We are becoming old hands at the metro scene. We met a couple from South Carolina at breakfast who decided to leave their car behind and take the metro to town. We showed them how to buy a ticket and get on a train. Once downtown we parted ways and told them to be sure to go up in the Old Post Office tower before doing anything else. The day before they had a shock when they received a $100 ticket for parking after 4 pm in what turned out to be a traffic lane during that time of day. It is much easier to leave your car behind and use the excellent public transportation available. Our Old Town Trolley tickets were good for another day so we planned to use it on the Orange Line for our second day of sightseeing. Our first stop was the National Archives which is the home of the original documents of our country’s history including the Declaration of Independence, the Constitution, and the Bill of Rights. The surprise was an original copy of the Magna Carta from the 13th century. It is one of only four remaining in the world and this is the only one in the United States. The importance of this first document of democracy in western civilization was thought provoking. The rotunda was impressive and beautiful and again I was a bit overwhelmed with the magnificence of the architecture and art here in the Capital City. In addition to the documents the Archives had some great exhibits. This includes one called “Big” with photos, commentary and displays of some of the bigger events in our history. It was fascinating. The Public Vaults were interesting because one could pull up more than 8 billion pages of text related to anything you wanted to explore. We saw old movie footage of WWII, D-Day, news reels, old movies, and enjoyed the ability to explore fragments of our history in astonishing detail. An especially interesting part was the display of photos and portraits of Presidents and First Ladies as children. I learned that researchers, filmmakers, designers, lawyers, historians, and others use these records every day. It was incredibly fascinating and we could have spent much more time. We left the archives and walked the few blocks to the National Botanical Garden and Conservatory just west of the Capitol on the Mall. Once inside the lovely glass building we were treated to displays of orchids, bromeliads, cactus and tropical jungle plants. Many were in full bloom. It was a lovely place to sit on a bench and enjoy. Of course, we had an agenda so moved quickly throught the gardens and on to our "next big thing", the Capitol. There is no charge to visit the Capitol, but tickets are still required. Security is tight as everywhere with no bottled water or liquids or any of the other myriad things that we have become used to not carrying in these days of airport security. The Capitol tour is well worth the time with guides that explain the history of this great building. We were treated to some of the inside stories about how it was built, burned by the British in 1814, burned again during the Civil War and then rebuilt. The Capitol Rotunda is huge and decorated with paintings and sculpture as magnificent as anything seen in the world. We then continued north from the Capitol Mall to Union Station for a little bit of lunch and more views of impressive architecture and great people watching. Back to our Old Town Trolley for a twirl around the town we were dropped off at the Metro Center for a quick ride home. We are recuperating in our room this evening, watching the news, having some wine and cheese and crackers for supper and catching up on photos and memoirs. It seems as though we have been here for a long time, and yet it’s only Monday, actually only two days here in DC. They have been really full days, for sure. So far, I am greatly surprised by the Capital City of my country. It is beautiful, full of open space, incredibly clean, and inspiring. I had no idea it would be like this. I had heard of crime and heat and humidity, traffic, more crime, and really had no idea that it would be so lovely. This morning it was breakfast again in the hotel, and we left for town at 8am to catch the 9am Green loop of the Old Town Trolley tours that we signed up for online before we left. We first traveled through the city to the northwest side and the National Cathedral, perched on one of the highest points in the city. The Cathedral is impressive, with true gothic architecture including the long nave, the tower, and flying buttresses for support. Many presidents have worshipped here and the sanctuary is beautiful. Sometimes when traveling in foreign countries, a saying goes around, "One more gorgeous cathedral" or maybe "one more gorgeous view". Sometimes it's hard to remember just what each cathedral looks like and only a few do stand out. This one was lovely, but not as moving as St Paul's in St Paul, Minnesota even, and probably not even close to St John's in Valetta Malta. But it was a nice big impressive cathedral and quite adequate for a US city. The real surprise, though, was the Bishop's Garden, tucked in at the base of the cathedral and filled with perennials and paths and pagodas that rivaled any I have seen. Truly a gem. The view from the tower was another chance to see how DC is laid out, still something that eludes my normally good sense of direction. Traveling back toward the city we saw Embassy Row, some quite grand, others a bit worn, and the Iranian embassy quite shabby and empty for the last 18 years. On to the picturesque part of DC called Georgetown, where many of the row houses are less than 8 feet wide in order to reduce the tax footprint which in the early days of the city was based on the width of the home facing the sidewalk. We got off the trolley to walk the M Street shopping district, explore the old Chesapeake and O Canal and towboats, and walk down to the waterfront. J. Pauls Brewery provided a truly tasty lunch and relaxing time watching the people passing by from our window table. Mo enjoyed a chicken quesadilla that was the best I ever tasted in addition to my own cup of perfect crab soup. We re-boarded the trolley back to downtown and then we switched to the Orange line that travels through the main part of the city, including the Capitol Mall, and used the tour as another way to get oriented to where things were and to plan our next day using the trolley to actually get off at the various stops to view the sights in depth. We arrived at another transfer point in time to switch to the red line that crossing the Arlington bridge to Arlington Cemetery, and managed to have enough time to see the main parts including the Eternal Flame at John F Kennedy's grave and to walk up the long hills to the Tomb of the Unknown Soldier. Once more I was surprised at how much something in this city moved my deeply. The ceremony of the changing of the guard at the Tomb of the Unknown Soldier was impressive and moving, and really quite lovely. Sadly, I learned that the fancy lithium rechargeable battery on my Nikon camera can't handle a full day of sight seeing if I haven't charged up fully the night before, so my photos of the changing of the guard are on my phone. Hopefully I can figure out how to get them on my computer. Whew. I am tired just writing all this, much less doing it. Dinner tonight is completely unnecessary with such a great lunch, and while I feel very much like a tourist, I am glad for a chance to spend some time here. We decided that Sunday should be a day on our own trying to get the lay of the land and learning how to get around in the city. We scheduled the shuttle provided by the hotel to take us to the Metro station in Ballston. It’s always a bit exciting and fun to figure out the transportation in a new unknown city and this was no different. The Metro is fairly straightforward and we managed our way around on our first day in town without any mishaps. It’s only about 15 minutes from the Ballston station to the Metro Center in the middle of downtown DC. This was fun for me because I have never actually traveled on a subway. Even my forays on the BART in the Bay Area haven’t actually been under the water. Trying to determine exactly where we were in the city itself was challenging at first. The city isn't completely oriented on the cardinal directions and my sense of direction is so messed up here that it took days for me to get my bearings. I make maps for a living so I should be a pro! Mo laughed and decided that she should be the one to read directions in the city and leave the country directions to me. One lesson learned it is a great city for walking and it is BIG. There are large wonderful open spaces that look deceptively short. It is misleading because of all the openness. For instance, from the west end of the Capitol Mall and the Lincoln Memorial to the east end and the Capitol it is about 3 miles. We walked a portion of the mall taking in many of the sites along the way. A perfect beginning was the exploration of the Old Post Office. The history of the building is complex and more than once it came close to being torn down. The tower tour is free and offers an excellent view of the city. It was great for our orientation and helped us get a feel for where we were located in relation to the rest of the city. Washington DC was once a swamp and the Potomac River flows to the south and west without many landscape features to use for orientation. From the tower of the Old Post Office, however, we could see in all directions. The National Cathedral is to the northwest on the highest point in the city. We could see all the way down Pennsylvania Street to the Capitol. Dominating the skyline to the south was the Washington Monument. After climbing the steps to see the 10 bells , we headed west to find the White House and see what we could of the Mall. Most everything here is something that you have seen on TV, read about, or seen in pictures all your lives. It all feels familiar, but it is really bigger than life. in real life. It is inspiring to stand outside the fence to the White House grounds and to hear people speaking many languages. Many seemed in awe while taking photos taking photos. We all took turns at a space along the fence to get a photo of ourselves with the White House in the background. Later, we walked along the huge grassy fields around the Washington Monument to the World War II Memorial, the reflecting pools and the white marble Lincoln Memorial. As I walked I remembered so many images from the news of protests and gatherings in this place. As our guide said today, this is the place where our freedom of speech is fully expressed. We can gather and protest here and speak our mind in this space. No dogs will attack us, no police with guns will shoot us down. The “I Have a Dream” speech rang out from these steps where I stood dwarfed by the Lincoln statue. It is moving no matter how cynical I might be sometimes about my government. We walked along the Constitution Gardens passing a lovely pond on the way to the Viet Nam Memorial. I knew about the controversy around this memorial, the ‘black gash in the ground”, but for me it was truly beautiful. Contemplative, reflective, simple and somber. The way it should be. It is very different from the WWII memorial with its sense of pomp and ceremony. Then, on the opposite side of the reflective pool, we saw the Korean War Memorial. The memorial was only dedicated in 1995, even though the Viet Nam Memorial has been here since 1983. The forgotten war. No wonder people were upset about the lack of a memorial honoring Korean War Veterans. The numbers are staggering. The Korean war lasted only 3 years and more than 40,000 troops were lost and more than a million United Nations troops were injured. In contrast, the Viet Nam war lasted 16 years with a similar number of casualties. No one talked much about the Korean War, and we have never signed a treaty or an armistice. It is a sobering thought. By the time we headed back west toward the Metro Center we were darned tired and both of us had aching feet and ankles. I think we walked more than 6 miles and were really feeling it. We planned to go on to Ballston for some supper, but on the way to the station we found the Elephant Castle Pub and stopped for good fish, chips and beer. It was a perfect respite before boarding the metro for the trip home. The hotel shuttle is doing a great job of picking us up and dropping us off and the reviews that said they were never on time were just not true. They have been great! Home to our comfortable room, a good shower, and a great night's sleep. Although lots of the stories here revolve around the MoHo and RV travel, we do sometimes wander off to see things in other ways. This time it was a trip to Washington DC, a destination too far away to manage a MoHo trip, at least while I am still working and have to deal with limited leave time. Neither of us had been to DC previously, and since my agency developed a great soils exhibit for the Smithsonian, I figured it was as good a time as any to take a week off and go see our Capital City. We flew from San Francisco on Saturday morning, leaving Jamestown, California at 4am to give ourselves plenty of time to negotiate the bay area traffic. Good thing! There were closed ramps and freeways in the midst of construction somewhere around Hayward that had us going in circles in the dark trying to find a way over the San Mateo Bridge. Never managed that, and ended up going via the Dumbarton Bridge instead to find HWY 101 and still make it to the Travelodge in time for the shuttle to the airport. Whew! We had plenty of time to get checked in and on the plane with no other mishaps. Our baggage was on time, the shuttle to Arlington was easy, and the Comfort Inn we had reserved turned out to be more than adequate. After we checked in, dinner was an easy walk across a very big very busy Arlington Blvd to a Chinese place called XO Taste. It was very similar to a Chinese restaurant we once went to in San Francisco, but at least there was also English on the menu. The entire place was filled with Chinese people, not simply Asians, but very much Chinese. We were the only Caucasions in the place. It was a bit embarrassing to be the only ones using forks. After a half-hearted attempt at using chopsticks we gave up and returned to our forks. The dinner was excellent and more than plentiful. Back home to a good night’s sleep, marred only by a stupid migraine for me. Sigh. Maybe it was the air pressure changes. More than likely, it was the MSG in the really great Chinese food from the previous night. Ah well. It made for a vaguely misfired day for me on Monday, but by evening it was finally gone and now I’m great.